Everybody's worse Nightmare on Elm Street? Or is it your friendly neighbourhood man in a hat? Yes it's Head Knocker Freddy Krueger on the knocker! Freddy Krueger from the Nightmare on Elm Street movies featured as a heavy resin Head Knocker by "NECA", packaged in a themed colour window box. 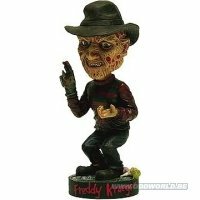 This Freddy Krueger finely detailed collectable headknocker is hand painted, and stands 8 inches tall.